Discover the otherworldly landscape of the Valle de la Luna (Moon Valley) on an exciting excursion from San Pedro de Atacama. Marvel at sharp peaks, undulating sand dunes and rugged caverns as you journey through one of the driest and most diverse deserts on earth. Explore the area on foot with an interesting and insightful guide, ascending to the top of a vertiginous dune to watch one of the most spectacular sunsets you’ve ever witnessed. Make a short stop to admire the unearthly landscape of the Crodillera de Sal (Salt Mountain Range), a rugged collection of canyons and sand dunes, before continuing to the entrance of the magnificent Moon Valley. Pay the entrance fee (not included in the tour price) then begin browsing the enthralling exhibitions of the museum, gaining insight into the geology and ecology of this unique place. Accompanied by your knowledgeable guide, venture to a small cave to explore the fascinating formation then ascend to the summit of a sand dune to watch the sun set over the valley. Climbing the dune only requires average physical fitness. Watch the sun caress the gentle curves of the landscape as it makes it descent, casting an eerie orange glow over the sands. 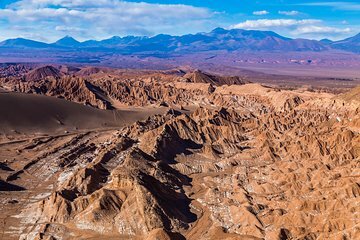 Appreciate the distinct beauty of the desert from this unique vantage point, and then return to the van for the relaxing ride back to your hotel in San Pedro de Atacama. Sure the moon valley is a must see, but don't bother with the sunset trip, rather visit in the morning or on your own. Collected from hotel at 3pm and got back to hotel at 8.30pm - could have been done in 3 to maybe 3.5 hours. Lots of aimless wandering and waiting with little direction or explanation from the guides. I had to listen in to other guided tours to get info.Large bus which was full with nearly 50 people.Sunset wasn't really worth it. Maybe watching the colours change as the sun was setting was interesting, but we reached the view point only minutes before the sun hit the horizon. View point was packed with hundreds of people.Worst tour ever! Don't bother. Very good Moon Valley tour, excellent guide, fantastic formations . Sunset a bit disappointing as we were expecting more colour changes. Quite a steep climb up the sand dune. Tour was okay, got good pictures, but felt the tour was a little too rushed and there were just too many people in the bus to have a unique experience. The sunset was so late that we just waited for 2 hours at the end doing nothing. Also many times, a lot of time was consumed waiting for people to get on to the bus. I wish they had a smaller group. Some of the hikes were reasonably uphill, so I would not say it is a cake walk with children. This was a fine tour, and the people contractor were great. But there was little value added beyond the transit to get to these places, and that's what you're paying for with one exception, which I'll note on that tour's review. If you have time and resources to rent a 4WD instead, you would be well advised to do so. A 2 star rating for the spectaculat scenery, but zero for the guide. He had to be reminded to explain ings in English as well as Spanish, and delayed our viewing of Death Valley with a long drawn out story concerning his grandfather, while the othe spanish speaking visitos were able to look around. We then had 5 minutes to see features of the valley before getting back on the bus.On arrival in Moon Valley carpark, we were route marched to the top of the ridge, with no explaination of the geology along the way. He appeared disintersted, and mentioned he had been guiding for 10 years - perhaps it is time for new career. Having been on over a dozen tours across South America, I had found this Moon Valley Tour run by Turistour to be unsatisfactory. To begin with, I had not expected such a large group (of 16+) and such little intimacy. It didn't help that our guide, Leonardo, turned out not to be much of a guide. He lagged behind much of the way and failed to direct the majority of the group. With the itinerary I had expected drop-dropping landscapes, and the experience had fallen much short of what i had imagined. Luckily the sunset finale at Moon Valley had saved me from ripping my hairs out. The exotic crevasses in the valley gradually mutated in iridescent shades into darkness as the sun descended on to the horizon. Was it worth the USD$30 i had splashed out? Definitely not. É um passeio que precisa ser feito. Não tem como ir ao Atacama e deixar de conhece o Valle de la Luna. Uma paisagem única e de tirar o folego.